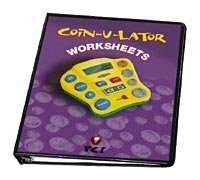 Reading Level Nonreaders Interest Level 2 – 12 The Coin-u-lator Worksheets were developed for students who need extra help in learning to count coins. When used with the Coin-u-lator, this program provides two visual learning methods: realistic coin graphics and a money calculator with a LCD screen. The 100 reproducible worksheets were designed to produce high-quality photocopies making all coins easy to identify and count. They are especially effective when coin counting is reinforced by placing realistic coins over the printed coins on the worksheets. An assorted coin package of 400 coins is available separately. This program has been called a breakthrough in helping students learn the process of counting coins. Students who struggle with basic money concepts can use the money calculator until the skills are mastered. After conquering the basics of coin counting using the Coin-u-lator, students can progress to completing the worksheets independently. The entire program prepares students for accurately using coins in everyday “real-life” situations.